One year ago today, I posted my first blog entry. What a year it has been. Thank you for all of you who have been reading this blog and participating in the dialogue, online and offline. Recently, I have gotten feedback from a couple of people who I am coaching with the recipe for recovery, and their chief complaint is that in the last week or so the Qigong has gotten harder to do, not easier, particularly the Medical Qigong for the Liver. They are feeling worse, not better. They are questioning whether they are on the right path. I know it is hard to believe that the better you are doing the worse you will feel for a while, but think about this: suppose a pool looks like it is filled with sparkling water, but the walls are completely covered in algae. If you scrape every wall from top to bottom, what will the sparkling water look like? Completely polluted, right? But aren’t you making progress in cleaning the pool? Don’t you need to get all the algae off of the walls to clean the pool? This is the point I am making in my paragraph above. If somebody saw the pool and did not notice the algae covering the walls, they would think it was a perfectly clean, sparkling-water pool. After you scrape the algae and before it is flushed out, the same person would look at the pool and wonder how it suddenly became so polluted. And such is the case with you. You have worked hard and were starting to feel a little better. However, this hard work released many toxins into your body, and this will make you feel “worse” or “more polluted” until you can release the toxins from your body. As I have mentioned before, when we fight Parkinson’s, it fights us back. When we are a couple of months into the recipe for recovery and we have been feeling like we are making progress, it is a blow to our faith to suddenly feel like we are physically going backwards. Parkinson’s tests our faith. Parkinson’s tests our resolve. Parkinson’s tests us to the core of our being. And we fight back. We start at the core of our being and chip away at Parkinson’s day after day after day until we recover. We have to be strong and we cannot lose faith in ourselves. As Dr. Sha would say, “I have the power to heal myself. You have the power to heal yourself. Together we have the power to heal the world.” Let’s be strong together and make this next blog year a powerful one for all of us. This entry was posted in Fighting Parkinson's Drug Free and tagged and cleaning the pool, Fighting Parkinson's. Bookmark the permalink. It felt very discouraging. Plus at the start of the flu, my tremors got more frequent and increased in intensity again, the worst they had been in months. Throughout, I have kept up (sort of) with the meditating, chanting, Jin Shin Jitsu, and Qigong, though my energy and enthusiasm…and okay! I admit it…my faith….have been less. Reading your post today, I recognize that, having seen the scummy pool and even swum in it, I pulled back. I have been going through the motions, and not putting my full heart and soul into it like I was before. Hi. You are welcome. Sorry you got the flu. 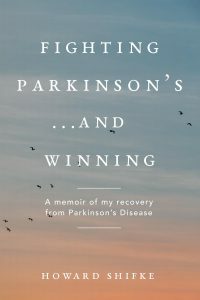 It has been a tough one this year even without the particular challenges of Parkinson’s, but it sounds like your attitude will push you over the hump with the flu. Thank you for your comments. I believe they will ring true with many.